On this page are present service manuals for Tohatsu outboard motors. Outboard motors Tohatsu - strong, light and environmental friendly engines with low emissions of harmful substances into the atmosphere. Tohatsu uses high quality aluminum alloy and zinc coating of internal surfaces in its motors. The introduction of the new engine painting process in 2006 not only changed the design of the engines, but also significantly improved their corrosion protection. The body of the Tohatsu engine is protected by several layers of special coatings, after which four layers of paint and a layer of special varnish are applied. 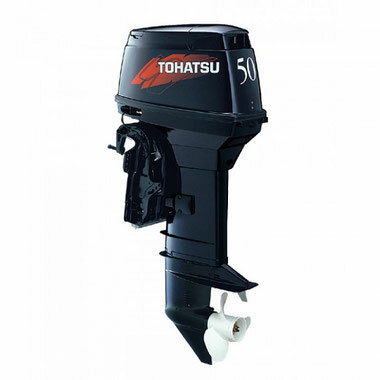 Tohatsu Corporation offers outboard engines ranging from 2.5 to 140 horsepower. For our country, the fact that Tohatsu motors are undemanding to the quality of fuel and oils is important. On the boats with the engines of this Japanese company, many records were set. One of them, no one in the world can beat for the past 10 years - in 1994 on a boat with a Tohatsu engine with a capacity of 2.5 hp only. The Atlantic Ocean was crossed. Unlike manufacturers of other brands, the company Tohatsu does not refuse the production of two-stroke engines, but on the contrary, improves and expands its model range. Tohatsu two-stroke outboard motors have a reputation for powerful and reliable outboard motors with moderate weight and compactness. The 2008 sales hit is the updated Tohatsu 5BDS, which has two fuel tanks - built-in, 2.5 liters and external 12 liters. For TLDI technology (two-stroke, low-pressure direct-injection engines), Tohatsu Corporation was awarded the prestigious “Editor's Choice” award of Motorboating Magazine magazine. A distinctive feature of the TLDI system is the dual throttle position sensor (TPS), which provides an accurate balance of air and fuel. Outboard outboard motors with direct fuel injection TLDI series have fuel consumption of 4-stroke models and 2-stroke performance. The TLDI system makes it possible to run smooth and steady at low revs with much less vibration, and provides the engine with good acceleration. By changing the way air and fuel were supplied, we managed to significantly reduce the amount of harmful emissions, their level meets the requirements of the Environmental Protection Agency (EPA) and the California Air Resources Board (CARB). Tohatsu company has established itself as a manufacturer of highly reliable 2-stroke engines of low and medium power. They are distinguished from competitors by their simplicity of construction, the use of reliable and proven technologies, and an excellent weight-to-power ratio. Tohatsu 2-stroke engines have a reputation for reliable and powerful engines with moderate weight and compactness. You will also find in the company Tohatsu four-stroke motors with a capacity from 2.5 to 30 hp. It should be mentioned that for the first time in the outboard motors industry, on Tohatsu 25 and 30 hp motors. applied electronic fuel injection system, which does not require a battery. In addition, the Tohatsu 4-stroke engine 30 hp It has options typical for more expensive models - a lift system and engine tilt angle adjustment that meet the requirements of EPA, CARB.